This is the third Canyon we’ve tested this year, and we’re finding its delivery of high-end parts for the money hard to ignore. The Nerve AM 6.0 comes with a travel adjust Fox Talas FIT fork and a Fox RP2 Boost Valve shock that you’d struggle to see elsewhere for anything like the asking price. Canyon’s ‘Hydro 14’ tagline refers to the 14 stages in the frame construction. A hot oil and water mix is forced through the initially round tubes to form the desired shape in moulds; the aim is to minimise welded-on reinforcements, and improve the strength to weight ratio of the frame. Our sculpted ‘mamba green’ 7005 alloy chassis still sported a huge gusset at the tapered head tube, alongside its distinctive sculpted ‘shark fin’ top tube. The Nerve has the steepest head angle on test, and also the lowest bottom bracket height. Out back, asymmetric chainstays have a true Horst link pivot, standard 10mm QR axle slot, and a post brake mount. The Fox fork and shock fitted to the Nerve AM is nothing short of amazing for this money — it’s all Fox’s best stuff, not lesser entry-level gear. The 120mm or 150mm travel Talas fork has a 15mm QR axle, and a low speed compression lockout lever to stop the fork moving. An oversized (XXV) aircan Fox RP2 comes with a two-position ProPedal lockout, which we actually left switched on most of the time to make the rear suspension feel tighter. The suspension at both ends is extremely supple and controlled. Quality Canyon-specific DT Swiss M1950 wheels offer a wide 26mm rim, making for a good tyre profile on our smaller volume 2.0in control tyres, but this is one area where Canyon doesn’t stomp the competition — both the Spesh and KHS boast lighter wheelsets. Stock rubber is well thought out Schwalbe stuff — a fatter 2.4in front Fat Albert, and Nobby Nic rear. The Canyon’s SRAM X9 3×10 transmission worked flawlessly, with a lighter action than some of the cheaper SRAM 2×10 stuff we’ve tried this year. Powerful Avid Elixir 3 brakes with on-the-fly reach adjusters were easy to set up, and come with a big 203mm front rotor. Branded Easton controls and a Selle Italia saddle look classy, but many riders will prefer a wider bar than the supplied 685mm Easton EA50 on an ‘all-mountain’ tagged machine. Special mention must also go to the beautifully smooth action of Canyon’s QR seatpost clamp. The premium Fox equipment on the Nerve AM 6.0 is the same kit we choose for our own bikes, and it is by far the highest performing on test. There is a level of sophistication and smoothness in the damping here the others can only dream of, and fortunately for the effective Canyon it is also strapped to a bike that can benefit from this extra stability and control. The Nerve AM rides very solidly and calmly in most situations, with the plush four-bar suspension offering excellent grip at both ends. It accelerates and climbs pretty well, but with a slightly over-active trait without the RP2 ProPedal lever flicked to the on position. 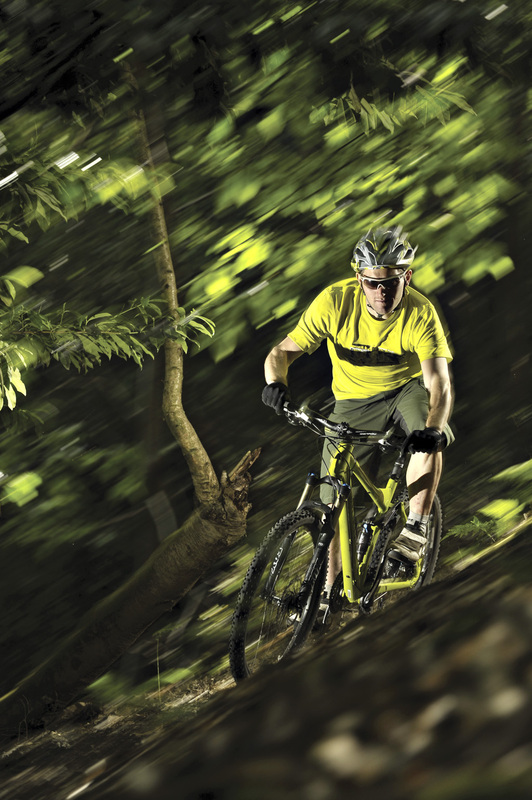 Its low BB and excellent tracking ability work very well in tight singletrack, and through slow-speed turns. Our 5ft 10in testers felt a touch cramped on the recommended 18.5in size frame, and with its steepish geometry the overall wheelbase is more akin to a 120mm travel bike. Because of this, it does feel less surefooted out on the open moors at flat-out speeds. Ultimately, all this potential made us wish that Canyon had fully delivered on the all-mountain tag. 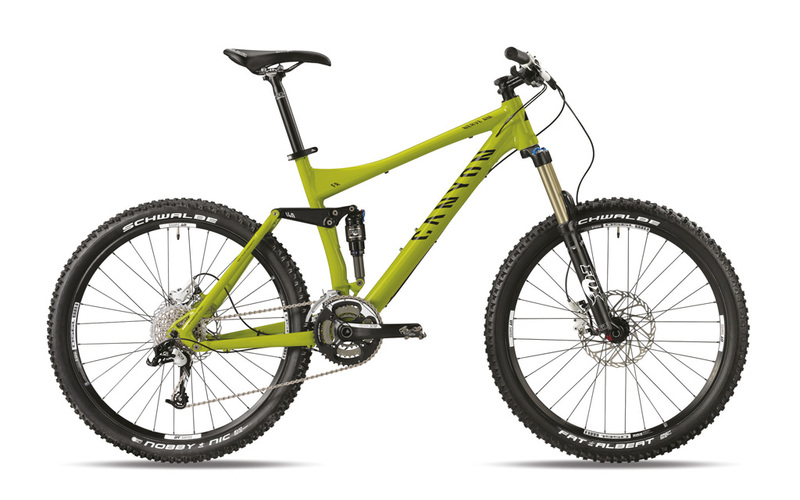 With the superb grip and stiffness on offer, the bike actually urges you beyond the point at which the geometry still feels assured and surefooted. The Canyon Nerve AM 6.0 offers easily the best equipment on test, and probably the best value anywhere for this money. This wouldn’t mean much if the bike didn’t succeed as a whole, but it’s a well thought out package. There’s excellent traction and grip, and decent power efficiency with the RP2 shock in its ‘ProPedal’ on setting. The geometry isn’t quite enabling the bikes maximum potential for confident riders, though. With everything else being so dialled, if Canyon made the frame 10mm longer and the 69º head angle was slackened by a degree or so, it would likely be looking at a perfect 10 rating.